People, us, our species, have made huge impacts to the biosphere. Get enough of us and give us a chance and we don’t just alter things a little bit, we can up-end, dishevel, and pretty much destroy ecosystems, AND, we can make such travesties come true without even realizing it! Fortunately for life on Earth, Us included, we also have the capacity to understand how we are affecting this Home. To be frank, given present day knowledge, Wikipedia, and technology, the days of blaming ignorance for messing up the biggest neighborhood are over. That never negates the need for scientific studies to predict, assess, and solve our impacts but given accumulated knowledge, nowadays, we should really know better. As luck would have it, at some point during the past forty years, there were enough people in Costa Rica who had the mindset to be aware, listen, and act to preserve biodiversity that managed to survive the massive onslaught of chainsaws and tractors that had shaved so much of this country clean. A fair percentage of Costa Rica ended up being protected and laws were made to try and protect the country’s ecosystems but by that time, a lot of the previously forested landscape, especially in the lowlands, was no more. It doesn’t take more than a glimpse at Google Earth to surmise why most highland species are still easy to find while eBird records of Crested Eagle, White-fronted Nunbird, and Great Jacamar are absent from large areas of their expected former ranges. Nevertheless, on a bright note, forest in Costa Rica is growing back in various sites, and there is far more consciousness about the importance of protecting biodiversity than in the past. There are stories of hope; at Selva Bananito where the owners opted to protect their remaining forests instead of logging them, and at Yatama Ecolodge where reforestation has turned this gem of a site into a haven for uncommon Herps and many birds. 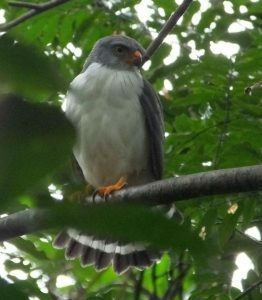 This Semiplumbeous Hawk entertained at this year’s Yatama count. There are also smaller areas of reforested lands like the Fortuna Nature Trail where, thanks to years of concerted effort by Giovanni Bogarin, we have a bit more habitat for everything from Uniform Crakes and Rufous-tailed Jacamars to Golden-winged, Hooded, and Worm-eating Warblers. Although the long road to comfortable levels of sustainability requires a lot more hiking and will always bring challenges, these and other sites that restore habitat are working to increase bird populations and diversity. 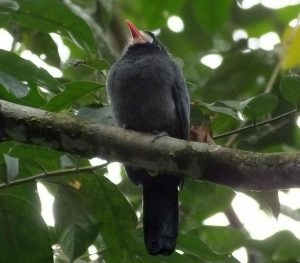 Instead of a few seedeaters singing from the cow pastures, reforested sites give us more motmots, antbirds, jacamars, and so many other species that require more complex, biodiverse ecosystems. 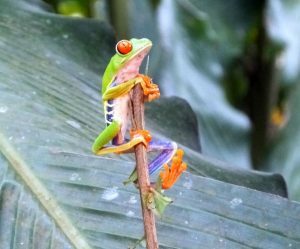 Red-eyed Tree Frogs have also benefited from vegetation growing back at the Fortuna Nature Trail. 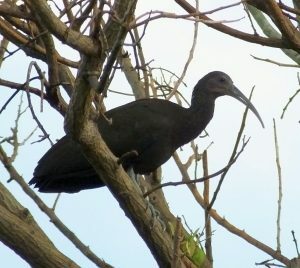 Green Ibis: For some not very obvious reason, this species has become a lot more common in Costa Rica. I really have no idea why but nowadays, its yodeling calls are an expected aspect of the evening bird chorus, and perched “vultures” need to be checked to see if the bird is actually an ibis. The ancient looking creature has also been showing up at sites outside of its historic range such as on the Pacific slope (like at Macaw Lodge), in the Central Valley (where I had one in a coffee farm), and even on the high slopes of Irazu Volcano! Green Ibis on vacation in a coffee farm. Ornate Hawk-Eagle: Yes! Compared to the 90s, there are more of this ultra cool eagle in Costa Rica, regular sightings taking place at Monteverde, Savegre, Tapanti, and most other humid forested sites at lower elevations. At the same time, since there are fewer Black Hawk-Eagles, one can’t help but assume that they are being displaced by the Ornate, perhaps due to an increase in forest cover. Scarlet Macaw: Everyone loves a success story, visit Costa Rica and you will experience the fruits of one where Scarlet Macaws are the winners. After years of effective protection, it seems that the stronghold populations of the Pacific lowlands have increased to the point of re-populating various other parts of the country, especially the Caribbean lowlands. These are likely also augmented by released birds. Recently, I have seen small groups of this spectacular species in the Sarapiqui region and even near Muelle. Don’t be surprised if some fly their way to Arenal. Cowbirds: Not all is good in the land of birds. Honestly, I don’t know if Bronzed Cowbirds have increased as of late, but I can say that Shiny Cowbird has become a regular species in various parts of the country. Since they act like cuckoos and therefore have to be affecting the nesting success of various resident species, I think we could do with a lot less cowbirds. Regarding the Bronzed, although they have been established for some time, I don’t see how they would have been a common historical bird, or were even present when Costa Rica was cloaked in cow-free forest. Great-tailed Grackles: Another one that increased some time ago, populations of this native beach bum went to town when they became adapted to living off the refuse of people. Like cowbirds, they also seem to do better when cattle are present. White-eared Ground-Sparrow: Given the description in Stiles and Skutch, it seems like this fancy little towhee has greatly increased. 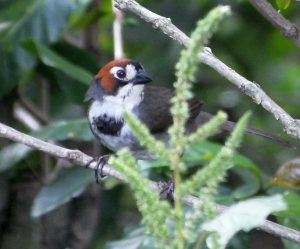 Unlike what is said about it in the first field guide for Costa Rica, it is actually common and easy to see on many coffee farms and other habitats of the Central Valley, perhaps because it has been outcompeting the endemic Cabanis’s Ground-Sparrow. Not as many of this one, it is likely affected by cowbirds. Edge Species: Par for the course in the era of deforestation but a few still merit a mention. Southern Lapwing naturally invaded from the south and some time ago. Presently, it can be seen in wet pastures and along rivers in many parts of Costa Rica. Keep an eye out for it as the plane taxis to the gate, you might get it as one of your first birds of the trip. Striped Owl also increased because of deforestation and even lives in the Central Valley. Tropical Mockingbird has likewise increased and these days, I hear the loud, jerky vocalizations of Black-headed Saltators in various parts of the Central Valley, a region it has recently invaded. Dry forest species: Locally, some dry forest birds have increased from moving upslope and into the Central Valley. Not that the populous intermontane valley offers a lot of green space but what is present seems to be increasingly used by such Guanacaste standards as Rufous-naped Wren, Lesser Ground-Cuckoo, and White-fronted Parrot. Who knows what other dry forest birds might be living around Alajuela? 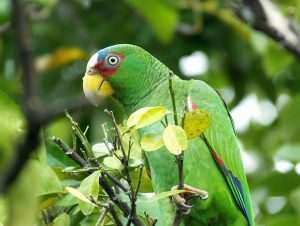 Watch for White-fronted Parrots in the Central Valley, especially near Alajuela. Although many more birds have declined, the species above and some others have certainly increased either since historic, more forested times, or during the past ten years. Keep an eye out for any out of range birds, and please report them on eBird (but please also include a photo! ).